While I’ve never been known for fits of melancholy, I’ve been doing some unhelpful dwelling about death of late. Like so many before me, including some of my friends and cousins, when you’re watching a loved one embark on their final journey you often start to consider your own mortality at the very same time. And that’s a double dose of depressing. The ebb and flow of life, and the people you encounter in it, means I’ve already been to more funerals than a trainee undertaker. But, thankfully, not since my grandparents died more than 20 years ago, I haven’t been to one that’s an immediate family member. And hopefully I won’t for some time yet but as Alzheimer’s continues to rob our mum of any twilight years whatsoever, from time to time I have to admit that melancholy does settle uncomfortably within my bones. They say losing someone to Alzheimer’s can be one of the toughest losses to endure. Not only does that person often not understand what’s happening to them – and in our case why the majority of her friends have deserted her because it upsets them to see her so afflicted (cowards)­ – but the system we have learned provides very little help either. Until very recently, we were totally at sea, struggling to decipher the spaghetti-like mess that is Australia’s social services. All the while not one medical practitioner was providing continuity of care, or salient advice, so we relied on our gut instincts and whatever would minimise mum’s levels of confusion and discomfort. For her own, and other’s safety, we also had to stop her driving, when as far as she was concerned there was nothing wrong with her at all. In mum’s reality everything is totally fine. If someone told you that you couldn’t drive anymore, how would you react? Well, mum reacted in exactly the same indignant way, but thankfully her carer and husband holds his nerve and comes up with evermore creative strategies so she can’t find the car keys. Lately she’s having delusions and thinks she grew up in England. She also is adamant that the people in the telly can see her. And a bit like with small children, we struggle with how to respond to these imagined issues when she will never understand the answers that we give. In the grand scheme of things, as long as she’s not hurting herself or others, I suppose what harm can it be to go along with some of her more preposterous and fanciful suggestions? All of these challenges, we face day by day and thankfully, soon, help will be at hand. My step-father has done an amazing job in what can only be described as utterly soul-destroying circumstances as he watched his partner of some 35 years change into someone we mostly don’t recognise. Yet she remains his wife and she remains our mother even if she is nothing like who she used to be. Over the past six months, both my brother and I have met two awesome men who each have equal parts strength and softness. 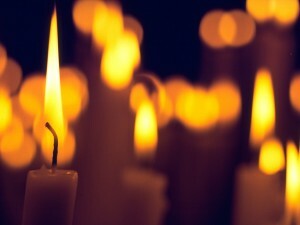 Sometimes I wonder if they’re guardian angels sent by God to help us as we rage against the dying of our mum’s light. And it’s a heartbreaking juxtaposition that we’re both embarking on wondrous new lives of own as our mother’s slips permanently away from us. Mum no longer recognises her nieces and nephews. One day far too soon she will no longer recognise us either. And yet we will continue to love her for everything that went before and for all the memories of her that will remain for years after. Her light will linger long after she has gone. That’s one of the few things of which I am certain. This entry was posted in NicNacs and tagged Alzheimer's by OMV. Bookmark the permalink.